Not often that one dedicates a sheet to a psychological operations aircraft, but that is exactly what PT Decal has done for its first 1/48 sheet. This aircraft was operated by the French during their war in Vietnam in the early 1950s. The ex-USAF C-47A was fitted with a bank of loudspeakers on the underside of the airframe. During these missions, the plane also tossed out leaflets. 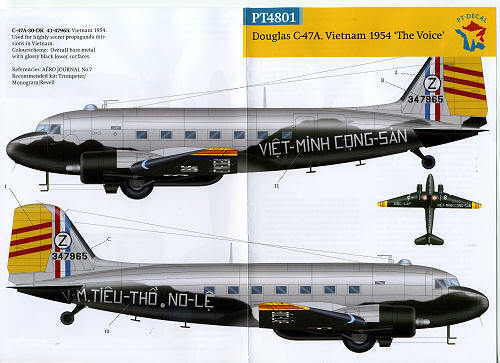 The aircraft itself was painted black on the underside with slogans in Vietnamese painted on the underside and on the side of the fuselage. The yellow rudder and wing tips with red stripes adds to the color of the aircraft. There were no markings at all on the upper surface of the wings. The former USAF marking was oversprayed with the black but still shows through. One actually has a choice of kits in 1/48 with the release of the new and pricey Trumpeter kit to compete with the older and much less expensive Monogram version. Either will do nicely. It would have been nice to have a set of drawings for the speaker bank, but it should not be that difficult to cobble together. 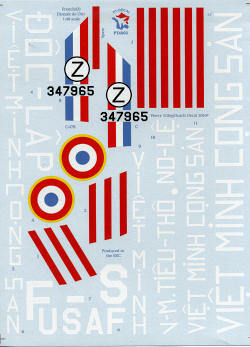 The large sheet is superbly printed with the markings crisp, clear and in register. A superb option for your next C-47 build.